Rebecca Taylor, Lib Dem MEP for Yorkshire and the Humber, joined protesters in Brussels opposed to plans to restrict access to electronic cigarettes (e-cigs). A top Labour MEP is leading the charge to regulate electronic cigarettes as medicinal products, a move which would significantly restrict their availability. LibDem MEPs oppose mandatory medicines regulation for e-cigarettes fearing that this would make them less available than regular cigarettes, even though inhaling nicotine vapour is infinitely less harmful than smoking tobacco. “I believe e-cigs are a vital weapon in the war against tobacco. There is a real danger that medicines regulation will weaken this weapon considerably. I will fight all I can to prevent that. We should be helping those who want to quit smoking, not pushing them back to tobacco. Lib Dem MEPs have been actively campaigning to make sure e-cigarettes remain readily available for people who want to quit smoking tobacco. While Lib Dems MEPs have been standing up for their constituents, there has been consternation at the actions of UKIP who have made a lot of noise about some of the proposals on tobacco products, but are not actually doing anything to stop them. 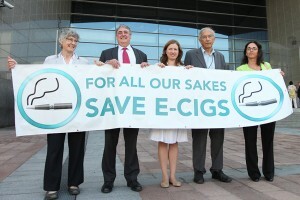 Photo of Rebecca with fellow MEPs campaigning in favour of e-cigs.